When beginning to explore PEAK, the best order in which to explore the modules is: binding, config, naming. 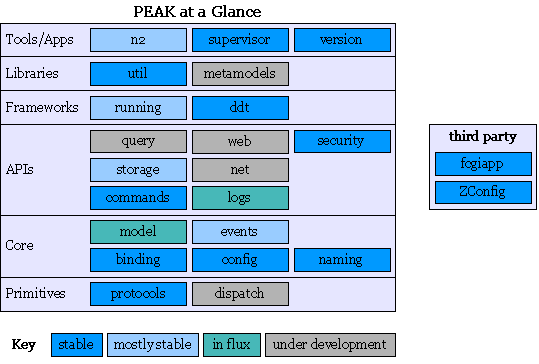 These core modules provide the component-oriented framework upon which most other PEAK modules are built, and they will also be at the core of any application which uses PEAK. The next layer to explore should probably be the runtime modules: ?running, commands, and logs. Combined with the previous core modules, the runtime modules provide most of the machinery needed for building a PEAK application. The model module provides a framework for implementing the ?DomainModel pattern, consisting of high level "business objects" isolated from storage concerns.